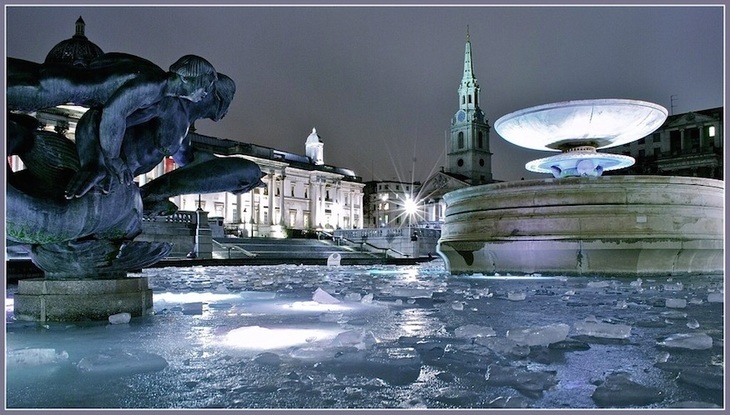 Zoe Craig What's The Coldest It's Ever Been In London? Frozen Fountain by Stephanie Sadler. Every year, there are plenty of news stories threatening a 'freezing' winter in London, which got us wondering — what's the coldest temperature ever recorded in London? 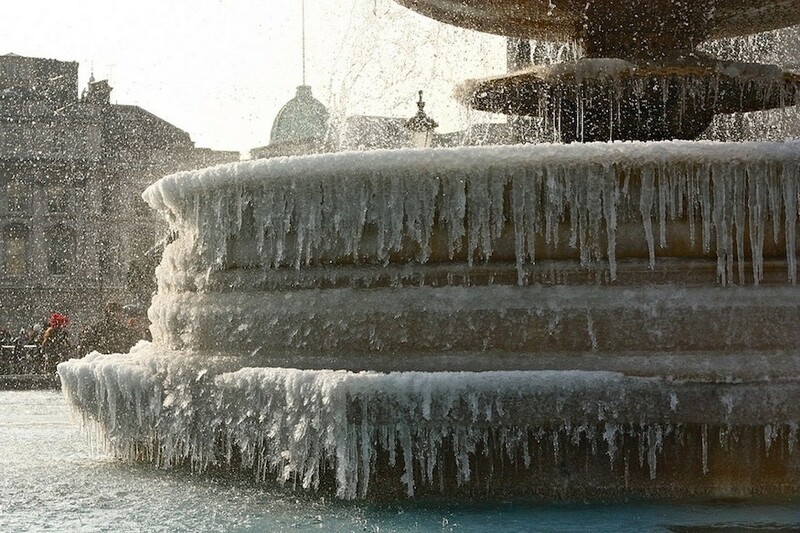 If you're looking at this century, the coldest London winter so far was 2009-10. According to the Met Office, the mean temperature in the UK was 1.51°C for winter that year, compared to a long-term average winter temperature of 3.7°C (from data collected between 1971 and 2000). Newspapers reacted in typically subtle fashion, with headlines such as London Colder Than Antarctica from the Telegraph, and Big Freeze Destroys Travel Plans For Millions from the Mail. Other noteworthy years include the winter of 1962-3: Beatlemania hit in November, and London was gripped by the last great smog. Fortunately, clean air legislation, introduced in 1956, was improving London's smog problem and the pea-soupers that had blighted London's transport system and threatened lives were becoming a thing of the past. 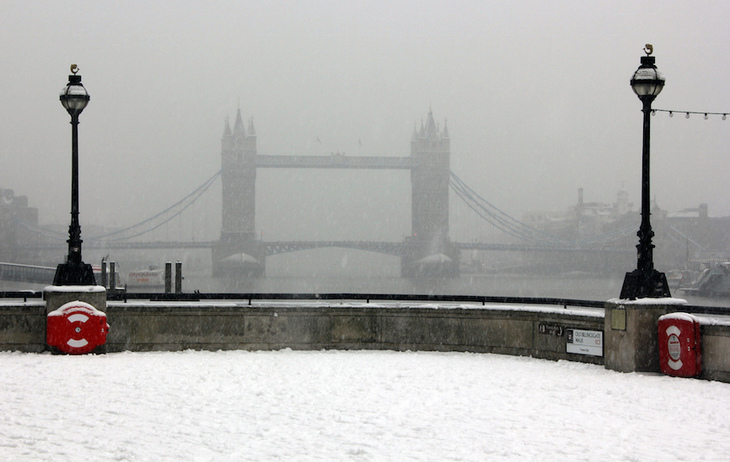 Tower Bridge in the snow. Photo by Stanfords Travel. Heavy snowfall at the start of December, followed by blizzards at the end of the month produced snowdrifts, some of which lasted for two months. The average temperature in January 1963 was −2.1°C, making the winter of 2009-10 seem positively balmy. Back in 1947, London struggled through another severe winter. Stricken by bomb damage, post-war rationing and and fuel and food shortages, it seems tough that the weather back then was adding to Londoners' already significant problems. 1947 is regarded as the snowiest winter of that century. The temperatures, recorded as Central England Temperature, fell to a mean of -1.9°C in February. Bulldozers, previously used for bomb clearance, were used to clear the snowdrifts. London on the rocks by JustB!. When the snow finally melted, it caused even more problems. At Teddington Lock, the second highest stream-flow was recorded since records began in 1883-4. Travel further back in time, and records, are, understandably sketchier. The winters of 1740 and 1795 stick out as being particularly extreme. 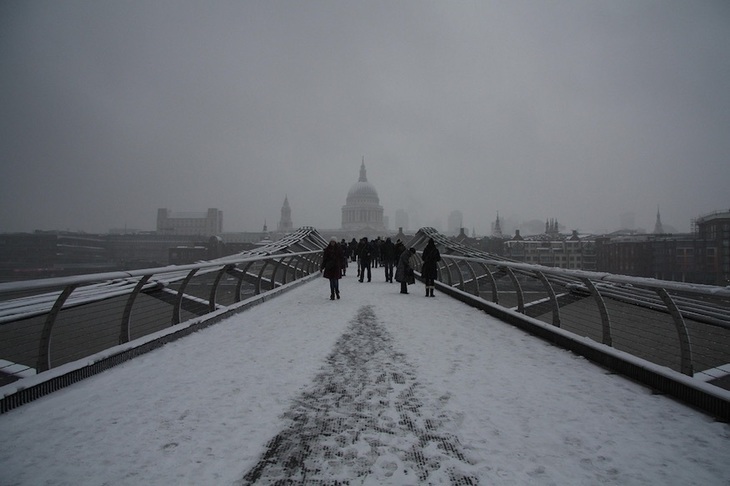 In winter 1740-1, the streets of London were clogged with snow and ice. As temperatures dropped (recorded at -2.8°C in January and -1.6°C February — its rare for temperatures to be below freezing for consecutive months) the Thames froze over and remained solid for around eight weeks; Thames shipping and London Bridge suffered considerable damage due to the ice. He recorded the temperature on 3 January as -24°C (Note these recordings have to be taken with a pinch of road salt: his thermometer, and the way it was used would have been very different to the precise meteorological equipment around today). In 1795, the coldest January in the instrumental era was recorded: a mean low of -3.1°C (as assessed by CET). The Thames froze over, and the usual 'frost fairs' were set up. The plummeting mercury was accompanied by heavy snowfall: snow was recorded on several occasions between 13 February and 2 March 1795 at Syon House in Brentford. On 25 January, an extreme temperature of -21.1°C was recorded at an unspecified location in England, though some references give this as London. If the somewhat dodgy records are to be believed, this marks the lowest temperature ever recorded in London. Evidence to back up this being an anomalous low include other extreme weather across Europe at the time: rivers froze across the Netherlands, and the Dutch fleet was frozen in ice in the Den Helder harbour in winter 1794-5 as well. Could The Thames Ever Freeze Over Again? How Religious Is Your Borough?